Coltishall is a busy little town, a large village really, on the edge of the Broads. For many years it was the nearest shopping centre for the large RAF base to the north, but this has now closed. There was a suggestion that the old base might be used for one of the government's planned eco-towns; this is now unlikely to happen, but in any case Coltishall feels no less busy than it did when the base was open, and with its southern suburb Horstead is still a mecca for traffic, both on the roads and for the more gently-paced vehicles on the River Bure. The large riverside pub on the east side of the village is a popular stop-off for boats on the Broads, and at any time of the year Coltishall has the feel of a place where people live and work. Less frenetic and more attractive than nearby Hoveton and Wroxham, it is still an ordinary place, and I like it for that. 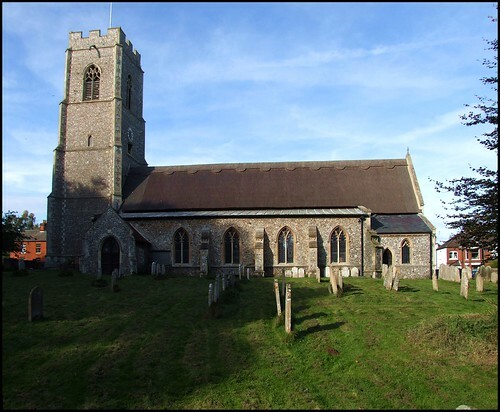 Along the road to Hoveton sits the tall and rather stark church of St John the Baptist, the long lines of its continuous nave and chancel softened by its roof of thatch. Take away the late medieval tower and you can see at once that this is an ancient building, almost entirely a 13th Century rebuilding of what was a Norman, and possibly even Anglo-Saxon structure. The two round openings in the northern wall certainly look like Anglo-Saxon windows, although as Dr Pevsner notes they are curiously high. The north side of the church is close to the road, but it hides the delight of a huge, gently sloping graveyard on the south side. Here, in the sunshine of late autumn, I was intrigued to find a fairly primitively carved 18th Century column with a hand holding a heart under a shining cloud, which I took to be masonic symbolism. For many years, this church was kept locked, but it is now open to visitors every day. You enter it, unusually in East Anglia, from the west, stepping down into a large, light interior. A south aisle, hidden from the road, creates a sense of space under the low ceiling, which might otherwise be rather oppressive. The predominantly clear glass allows the white walls and ceiling to glow. What glass there is is very good indeed. A Flemish roundel, set in a strange 19th Century round window probably intended to echo the Anglo-Saxon openings, depicts the head of John the Baptist being brought to Salome on a platter, and the east window is a fine example of the work of Powell & Sons. The only division between nave and chancel is the screen, which is elegant but rather over-restored. Looking back west, a neat little 17th Century gallery is shoe-horned into the space beneath the tower, an enchanting detail. Three decades in the early 18th Century brought three rather grand memorials, a reminder that Coltishall was an extremely wealthy little town in those days. Its main industries were malting and boat-building, for both of which it was handily placed on the navigable stretch of the Bure, but these fell away during the course of the 19th Century. As Pevsner poignantly observes, the last wherry was built in the once-thriving Anchor Street boatyards in 1912 and the last malthouse closed in 1927, and the rows of once fashionable shops closed with them.